This morning all of Scampy's electrical components will be hooked up. This hooking up is sooooo easy to do! 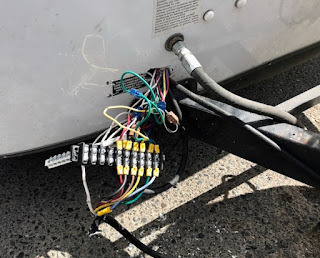 The wires going into Señor Tránsito's 7-pin connector are all color coded. Our Scampy electric schematic shows which color goes to each pin. The wires coming out from that 7-pin connector, have matching color coded wires. The wires inside Scampy have the same color codes. All that is necessary to do this morning is to purchase an electrical connector terminal strip probably from The Home Depot. Then, all of the color coded wires shall be clamped into the terminal strip so that each color going into the strip matches the same color coming out from the strip. A terminal strip makes the electric connections as these very neat, easy to do and secure. The next thing to hook up is Scampy's new deep cycle house battery. There is a charge wire coming from Tránsito's alternator that connects to this battery's positive terminal. Also going to the house battery is the output from our Yingli 250 watt solar panel. Our newly installed deep cycle battery will eliminate two batteries from the Scampy Team. One 95 amp-hour battery presently located inside Tránsito and one 35 amp-hour battery mounted on Scampy's tongue. This morning we will head out from Helena bound for Gillette Wyoming where the Family Motor Coach Association rally is being held. The people that we have met in Montana since arriving here have been sooooo friendly. Something is very special about Montana folk! Helena skyline from our room at Hilton Double Tree Hotel at 5:30 am. George figured that the wiring installation would be straight-forward. Zim-zam & done! Nope! Little nudges kept popping up. The hooking up of the hot wires to the Terminal Block and ground wires to the Ground Bar went well. That was done by 10 am. As the hot and ground wires were attached, it became apparent that a much longer slot would be required in order to get all this stuff inside Scampy's cabinet. George guessed how much to enlarge that slot. Turned out that we could have used about a 1"-longer slot than we made. But we made do. It was a tight fit, but all that stuff is now inside Scampy's large cabinet. When the new deep cycle battery was connected, it became abundantly clear that the power of this battery made everything connected to it run much better. This includes the 12-volt DC to 120-volt AC inverter. The ceiling vent-fan. The interior lighting. Whoever or whatever bosses these kinds of jobs, eventually that imaginary guy makes his presence known! When the 7-pin connector circuits were completely installed, not one of those circuits fired up! Marker lights. Turn signals. Emergency blinker lights. Nothing worked. We just went about cleaning the job up. Took about half-an-hour. When everything was put away and Scampy and Tránsito were tidy once more, The Boss relented. All the marker lights began working! After working about 6-hours, The Scampy Team pulled out from The Home Depot's lot. Everybody is delighted to be on-the-road again! There is no telling how far that ancient critter George will be able to travel today. "That's wait-and-see Pudding. "We must wait and see!" PS: Aunty Rosie came from England. Those English folk said stuff like that! Aunty Rosie married my Zaida [Grandfather] in 1937 after my Baubi [Grandmother] died. George ran out of energy a few miles before reaching the crossroads Town of Three Forks Montana. There is a store in Three Forks named Wheat Montana Bakery and Deli. George bought a "Wheat Montana Bakery and Deli" T-shirt. While we were inside the store, a customer commented that Three Forks Montana should be famous for their wind not their wheat! The Scampy Team is backed in hard against a tall building so that Scampy would be less wind-shaken! Baby Boid's bedtime is just about now. Boid seems to be extremely content if his cage is covered with what we have come to call, "The Black Blanky Of Love" around this time each evening. Boid is a lovely creature of habit. He wants what he wants at the same time each day. He is, however, influenced by the changes in the light as the year move on. Earlier today, in order to obtain some protection from the buffeting wind, Scampy was camped hard up against a tall building as we Blogged to you about before. When the wind died down a lot, Scampy and The Team were able to move from that place which was next to a noisy cooling unit. We are now camped next to the bottom of a berm which raises the highway. That berm is protecting us a bit from the wind. We just love doing things like this that make us more comfortable! Gotta love it! OK it's Saturday time to get me confused here ? running lights are brown ! left turn stop/signal is yellow ! right turn stop/signal is green ! Red is usually reserved for auxiliary for your battery which you do have ! 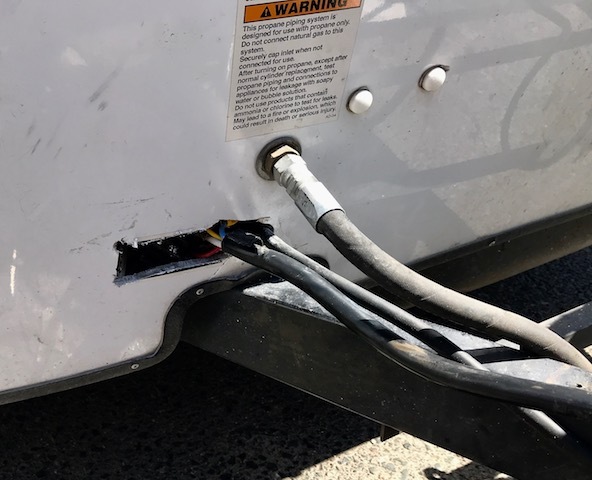 Good heavens I hope you don't have your solar panel hooked up to your trailer wire? Harness ??? Our Yingli solar panel is mounted on Tránsito's roof and power runs thru a roof fitting to a Renogy 40-amp Battery Charge Controller mounted inside Tránsito's rear storage attached to a shelf. Remember back aways you clued me in on how to mount the solar panel using the blind threaded inserts in Tránsito's roof? The AWG is determined by the load. Scampy's load is 4-LED lights. An iPhone. My Mac Air. Yes, Scampy's former owner had electric brakes installed. And I, in my ignorance, did not use them while towing Scampy with my Honda FIT! Not a good thing for Honda FIT's very thin steel UniBody frame!! Kinda damaged the UniBody! Buy some oatmeal at Wheat Montana. Yum! Just by coincidence, The Scampy Team's Blog is about food this morning! You are an amazing man, George! Forever learning and fixing and learning more. Wonderful blog. That's good news! Perhaps my future as well? The current Queen of England is Elizabeth II and is 92 years of age. Her mother, the "Queen Mother" and also given the name of Elizabeth, passed on at the age of 102 in 2002.